So now that I've written my review of Pacific Rim I thought it might be worth getting into the comparison that everyone seems to want to make: Pacific Rim vs. Neon Genesis Evangelion. Are they really all that similar? Let's break it down. Ever since the first trailer for Pacific Rim went up (and possibly even before that) people have been comparing Guillermo del Toro's new kaiju vs. mecha film with Hideaki Anno's decades-older mecha TV series. For some, it's been a kind of praise ("oh my god, Pacific Rim looks so awesome, it's just like Eva"). For others it's been a way of snidely dismissing the movie ("Eva did it first and better"). Never mind that all these comments were made long before the film was ever released; it seemed to be the conversation that people wanted to have. To someone who's been part of the North American anime culture for about a decade now, this is nothing surprising in of itself. In fact, comparing Western media to anime and accusing the former of plagiarizing the latter is a longtime pastime of American anime fans. The Lion King? A rip-off of Kimba the White Lion. Firefly? Nothing that Outlaw Star hasn't already done. And then there's The Matrix, which the Wachowskis have straight up said was inspired by Ghost in the Shell. In my experience, people are often far too quick to use the "p" word and to confuse an homage (or simply coincidence, which does happen) with a rip-off. But because it makes an interesting discussion and I'm always willing to talk about Eva (and now Pacific Rim) let's give it some consideration nonetheless. First of all, what do the artists behind Pacific Rim have to say on the subject? 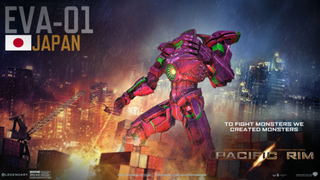 I did love Evangelion very much, but I actually wrote most of Pacific Rim before I saw it. Going from their own statements, it seems the influence of NGE upon Pacific Rim was minimal or incidental at the most. However, for a lot of people, that's simply not enough. After all, some might ask, why would the artists admit to plagiarism (ignoring the fact that a lot of artists regularly cop to their inspirations all the time, as del Toro did in the above quote)? So let's get down to the details. What are the similarities between NGE and Pacific Rim? Let's count the ways. They both feature giant robots. That's certainly the biggest, most obvious similarity and the one that probably started the whole comparison in the first place. That being said, it's not a very specific comparison, given that NGE is only one of a very large number of mecha animes from Japan (many of which predate it). Furthermore, while the Jaegers and the Evangelions are both mecha, they look fundamentally different if you actually directly compare them and while the Jaegers really are just giant war machines, it's a pretty significant point of NGE that the Evangelions are not. The giant robots were created to fight giant monsters. Admittedly, the line "to fight monsters we created monsters" is pretty damn close to something the characters in NGE actually say at one point and indeed, an important theme of the show is how the Evas are the power of the Angels (barely) harnessed for the salvation of humanity (sort of). But again, this point breaks down if you give it more serious consideration. NGE didn't invent mechas vs. kaiju and while the line evokes NGE, the Jaegers themselves do not. The Jaegers aren't created from the kaiju; they're entirely man-made. The Evas, on the other hand, are fundamentally Angel-like. The pilots link up with their robots through a neural interface. This actually has a fair amount of credence as a point, but I'm not entirely sure it's enough by itself. Most mechas are piloted mechanically, rather than through a brain-machine interface, but just because NGE and Pacific Rim are similar in this regard doesn't mean that the former inspired the latter, especially when cybernetics is becoming an increasingly popular subject in modern sci-fi (and real-life). Additionally, Pacific Rim has the extra bit about how it's only possible to safely pilot a Jaeger when you have two pilots, not just one, which (with the exception of Eva 3.33, which only came out last year) isn't the case in Evangelion. So we'll count this as evidence of a connection, but hardly conclusive. The nations of Earth have banded together to stop the threat to humanity's existence. This is an old, old trope and hardly unique to the mecha genre, let alone Evangelion in particular. Moving on. The world is governed by an obfuscating council of the nation's leaders. See the previous point. Besides, the council in Pacific Rim is only vaguely reminiscent of Seele. Vaguely. At best. The female lead has partially blue hair, kind of like Rei. Now it's true that Rei has been copied and pasted over and over again from one movie/series to the next, so much so that there's even a trope named after the phenomenon. But really, I don't think Mako's a strong case for Rei-cloning (pun intended). For one thing, while Rei is deeply, deeply emotionally repressed and extraordinarily shy, Mako isn't afraid of showing her emotions and indeed, gets pretty angry/scared/playful at various points. Granted, Mako is probably more similar to Rei than any other character from Eva and she does have a father-daughter relationship with the commander similar to (but healthier than) the relationship between Rei and Gendo, but I don't think it's proof-positive of a connection. There's one mecha that has that one, single eye, kind of like Unit-00. That really is a stretch, considering that in every other way Crimson Typhoon looks completely different. And that really just about covers it. At one point I thought they were using some kind of liquid breathing like in NGE (or The Abyss) when it showed the golden liquid in the two Beckets' helmets at the very beginning, but then that was dropped like a rock and never mentioned (or shown) again, with the Russian and Chinese pilots using helmets that would be completely incompatible with that kind of thing anyway. Really, the truth is that Neon Genesis Evangelion and Pacific Rim do share a fair amount of similarities. But most of them aren't anything that hasn't been seen in hundreds of anime before and since and the rest are possibly just coincidences. It'd be as if having a costumed hero was enough to claim that Iron Man, Captain America, Spider-Man, and The Dark Knight were all rip-offs of Superman (and yes, I know the claim has been made, but let's be serious now). More importantly, the tone of the two is completely different. While Pacific Rim is an earnest, big-hearted celebration of the mecha and kaiju genres Neon Genesis Evangelion is a deconstruction of those same genres. Comparing the two is like comparing The Incredibles and Watchmen. Yes, there are some interesting similarities, and yes, even a few (mostly minor) plot points are the same, but fundamentally one is a joyful celebration of the genre while another is a critique of all the underpinnings that hold the genre's conventions up. There's nothing wrong with enjoying both, but let's not pretend that they're the same thing.